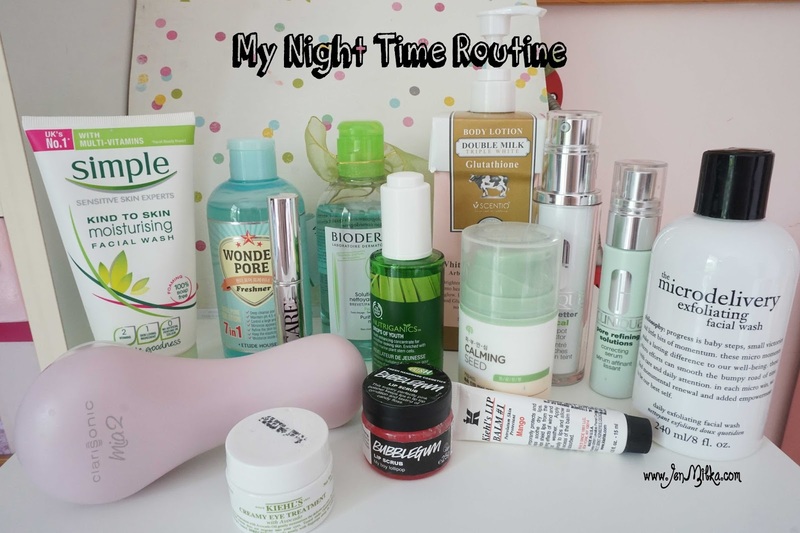 This is the most requested post from all of you... my night time routine ^^ *yeiihh..*. Well I tried a lot of products so my skin care routine changed most of the times. At this moment, this is my stable night time routine and stable products for my night skin care routine. Me and my brother stay with my aunt and her family. My mom, dad and my little sister live at different city from me, so I practically live by my own. I spend most of my days with blogging, watching, eating, reading, etc in my bedroom. I sometimes out for hangout, date, or event and if I do, I usually back home quite late. The first thing I do once I get home is light up my candle. 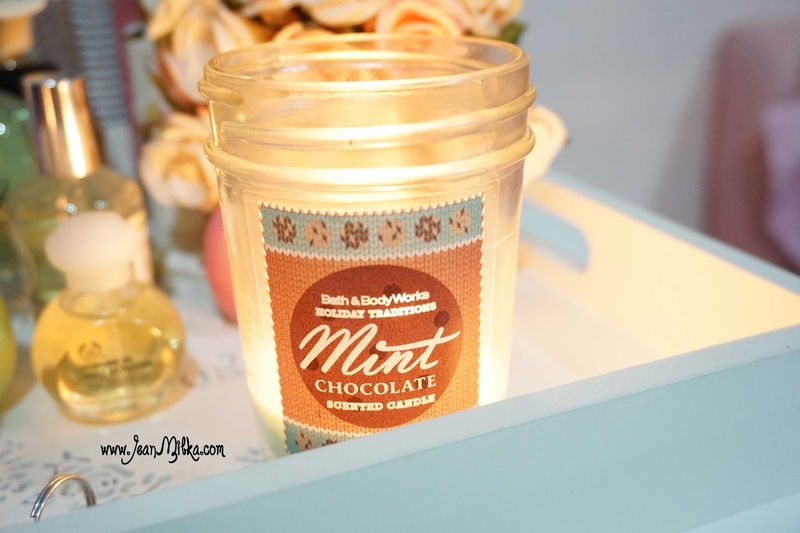 My favorite candle right now is Mint Chocolate from Bath & Body, which smells like chocolate milk with minty scents from cool peppermint. I love how amazing my room smells cause of the burning candle. Because I haven't had dinner, I come across FoodPanda which is a delivery website that make it easy for you to find any delivery service around your place. It is also available in mobile version. Most of the times I order a delivery service on my way home, so my order arrived not along after I arrived. 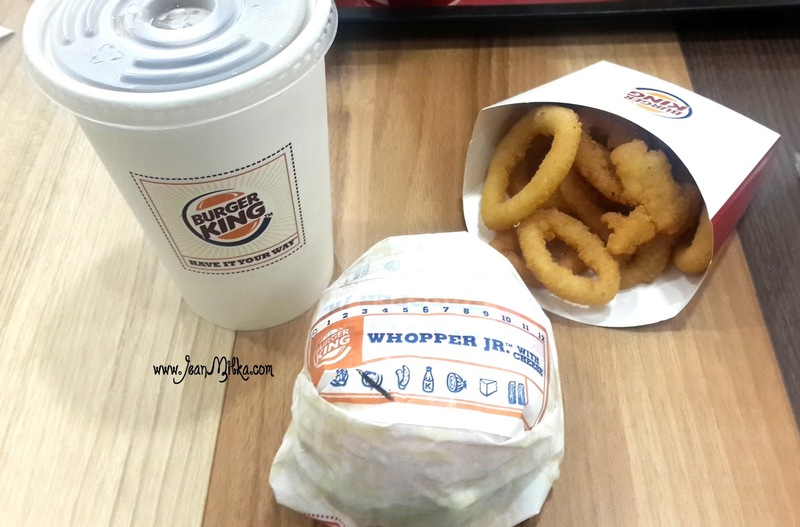 FoodPanda is a great application for people like me since practically I live alone. 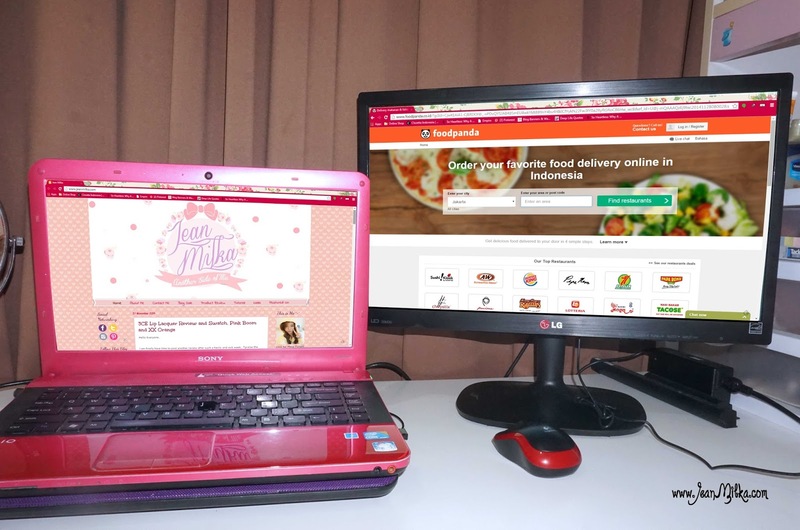 If you live at Jakarta, you can simply visit this link, and check it out if your favorite restaurant provide delivery service or not. While waiting for my delivery, I will check my blog, Facebook, and beauty video from my favorite beauty gurus. After finished my meal, I will start to remove my make up. 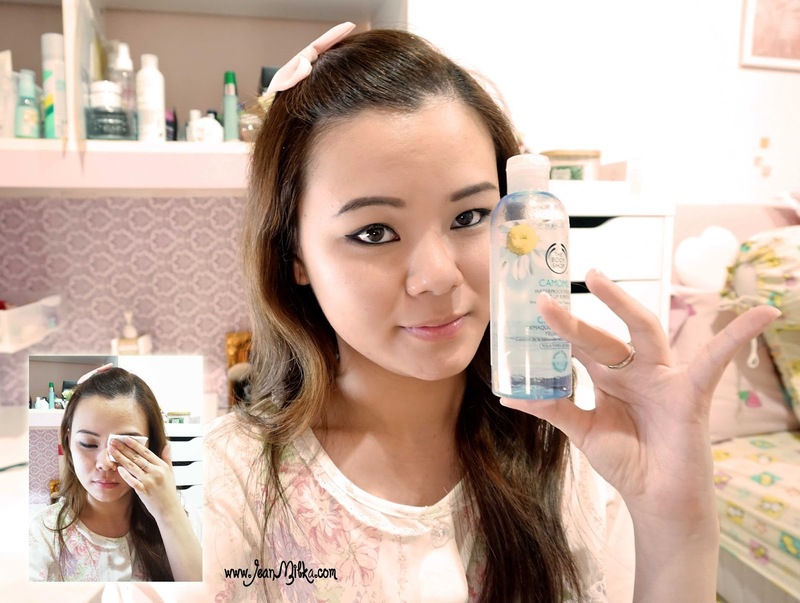 My favorite eye make up remover is Camomille Waterproof Eye and Lip Make Up Remover from The Body Shop. This is my third or fourth bottle of them and I almost run out of this one too. It's easily removed any waterproof eye makeup that I used so far. 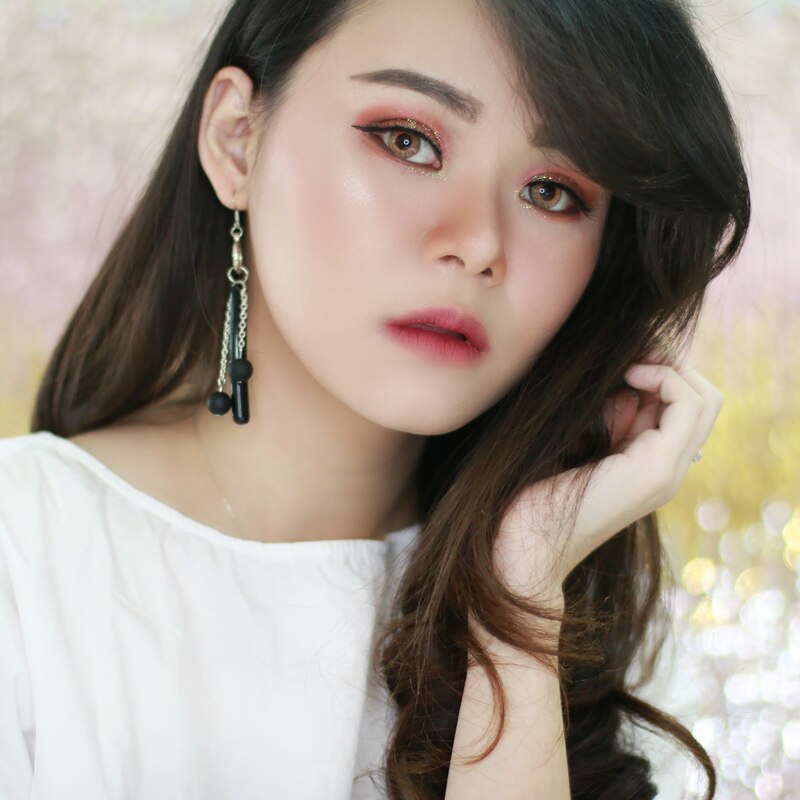 When it comes to eyes, you should treat them gently, so I will only patted my eyes and let it releases my eye makeup for a second and remove it gently. After that I will using Bioderma Sebium H2O to remove the rest of my makeup and any left residue on my eyes. There are two type of Bioderma cleansing and makeup removing water. There is Sesibio for sensitive skin, and Sebium for combination to oily skin. 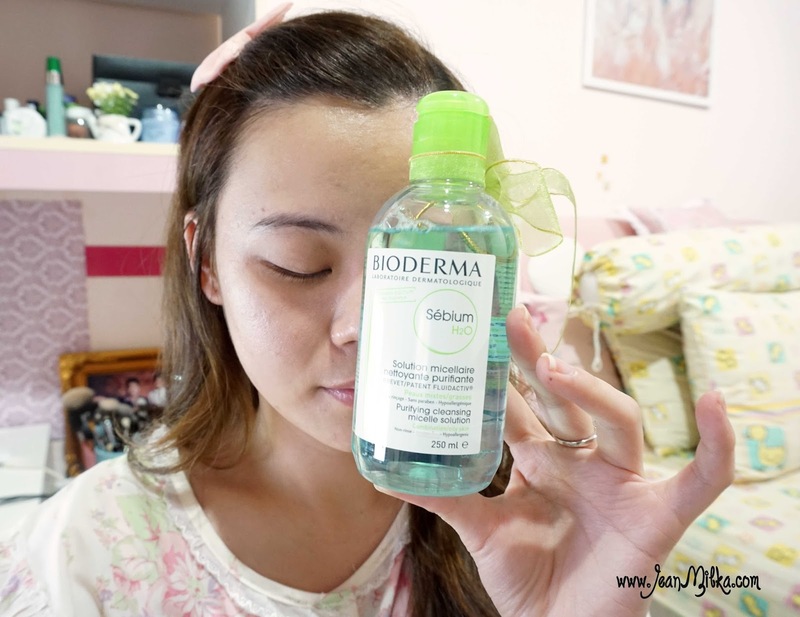 I will post my review about them this week, follow my blog and check my review about this popular cleansing water from Bioderma. Because my skin type is oily, I wear foundation when I go out most of the times. I prefer matte finish, full coverage foundation than BB Cream or tinted moisturizer. I rather go out with foundation or not at all. That is why, remove my makeup is very important for me. You can't sleep with full coverage foundation, it will clog your pores and cause breakouts. If I am out all day and I use full coverage foundation, I prefer to remove my makeup with Tsukika Cleansing Cream from Menard. Tsukika Cleansing cream from Menard is a cream texture that turn to oil once you blend it. I feel oil base makeup remover is better in removing makeup than water based cleansing like Bioderma. This product is not really necessary if you only use BB Cream or tinted moisturizer, Bioderma cleansing water already did a great job to remove makeup actually. I had shower before I leaving home that day, so after I finished taking time to blending my cleansing cream to cleansing oil just because I like to do it ^^ I'll go to my bathroom and rinse it with water, that is what the counter girl tell me to do with this specific cleansing cream. 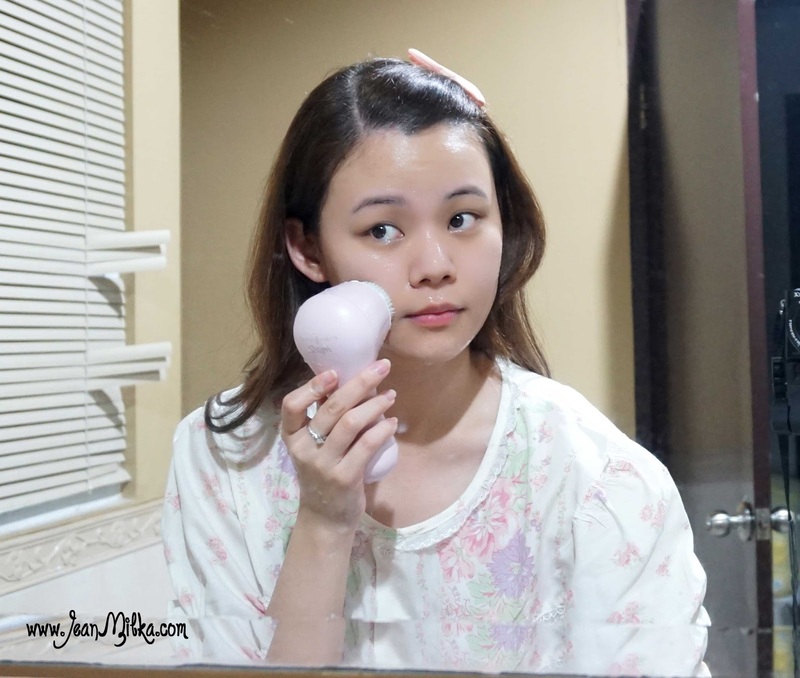 3 - 4 times a week, I will using my Clarisonic Mia 2 with Kind to Skin Moisturising Facial Wash from Simple. This facial wash is highly recommended for sensitive or dry skin. It doesn't make my skin feels dry at all. Once or 2 times a week I will exfoliate my skin with Microdelivery Exfoliating Facial Wash from Philosophy. I have a lot of blackheads so it is very important for me to regularly exfoliate my skin with micro facial scrub. So I either only wash my face with Kind to Skin Moisturising Fasial Wash from Simple, or with my Clarisonic, or I will exfoliate my skin. It's really depends on my skin condition and what foundation I wear that day. After that I will rinse my face again, and for the last rinse step, always make sure that you rinse your face well. Of course you don't want any soap residue on you skin especially around your hair line, since any soap residue can cause breakouts. 1. Toner : I am using Etude House Wonder Pore. You probably already know that pores is my biggest enemy. This is my second bottle of this toner and I love it. I don't think it minimizes my pores, but it makes my skin feels fresh and clean also control my oiliness. 2. Pre Serum : This step is not stable in everyone skin care routine, but I like to use Nutriganics Drops of Youth from The Body Shop. You can check out my review about this product here. 3. Serum : I currently using 2 serum from Clinique. First one I use Clinique Even Better Clinical Dark Spot Corrector focusing on my jaw line and forehead since there are where I have dark spot the most. And I also use Clinique Pore Refining Solutions around my cheek, forehead, and chin. Serums are designed to penetrate and treat various skin conditions. You can use one or more serum in a time, depends on your skin problems. 4. Eye Cream : My favorite eye cream is Kiehl's Creamy eye Treatment with Avocado. I almost used it up, but I won't repurchase it for now since I have another eye cream that I wan't to try. I never review it before, but actually I love how moisturizing it is on my under eyes, but the down side it down side is it doesn't eliminate puffy eyes. 5. Moisturizer : I am using The Face Shop Calming Seed Skin-Resting Cream at this moment. You can check out my review about this produt here. 6. Eyelash serum : This step definitely optional, but if I remember *cause most of the time I forgot to* I will apply Optilash which is an eyelash growth serum that supposed to make your lashes growth even longer. I have using it for couple months, but I can't really tell the different even though my mom said that my lashes looks longer. 9. Lip Balm : Last but not least is lip balm. I curently using Khiel's Lip Balm #1 Mango which I really love the scents and how moisturizing it is on my lips. 10. Acne Gel : I forgot to include Clinique Anti-Blemish solutions on the picture, but that is the acne gel I used if I have acne. Last but not least, I will apply a body lotion to keep my skin hydrated. I currently using Dobule Milk Triple White Body Lotion from Beauty Buffet that you can get from Copia. That is all for my night skin care routine. I am really enjoying my night skin care routine and no matter how tired I am, I can't fall a sleep with my makeup on. 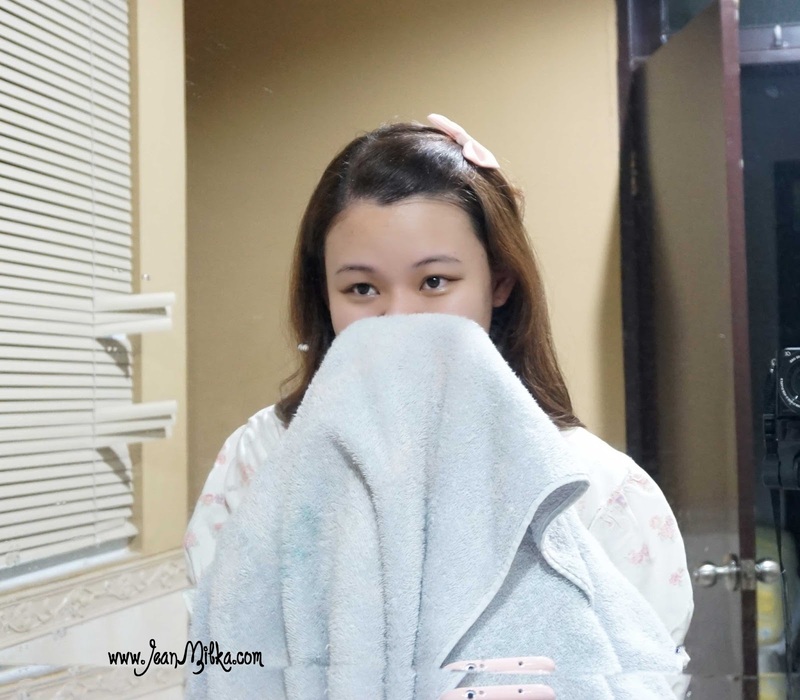 I used to skip my night skin care routine, especially if I didn't go out for the whole day. After I keep trying to get used to skin care routine, it become part of myself and my skin will feel uncomfortable without it. 17 komentar on "My Night Time Routine, Skin Care and The Products"
Clarisonic.. it's really worth the investment. If you wear makeup often, clarisonic is really helping to remove your makeup and make sure that it doesn't clog your pores..
Wow great skincare routine! 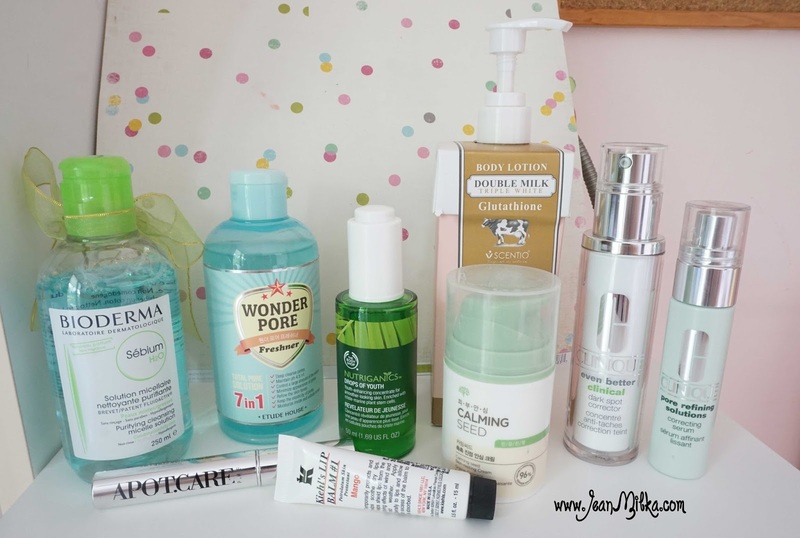 !~~ How long do you need for your routine? I like your blog!! It takes 20-30 minutes ... hehehehe... all because I like to doing that, I like to taking as much time as I want.It's one of my interpretation of me-time..
Mulus banget ci mukanya. Udah lama banget enggak pake skincare brand lain selain obat dokter ku huhuhu jadi kangen. Kebetulan sich lagi cukup okay skin nya.. tapi aku tetap banyak pores dan blackheads sich..
setujuuu jean, secapek apapun aku, ga mungkin lgs tidur tanpa lakuin skincare routine XD apalagi sampe skip ga bersihin makeup, pantang banget wkwk. Post yang bagus kak! Kak beli lilin sama eyelash serum nya dmna ya ? :D thank you! Terimakasih sudah membaca ^^. Lilin nya kamu bisa cek IG @lumierecorner, dulu beli di situ. Tapi sekarang Bath and Body Works sudah ada juga di Kota Kasablaka dan Grand Indonesia. Nah di situ juga ada lilin beraroma gitu. Untuk serumnya beli di Beauty Box Indonesia.